"2016 Harry Potter Club READ Poster" by Michael Backus, Natalia Wan et al. 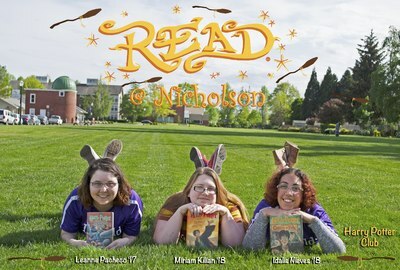 Leanne Pacheco, Linfield student, class of 2017, reading Harry Potter and the Prisoner of Azkaban, by J.K. Rowling, Miriam Kilian, Linfield student, class of 2018, reading Harry Potter and the Deathly Hallows, by J.K. Rowling, and Idalis Nieves, Linfield student, class of 2018, reading Harry Potter and the Goblet of Fire, by J.K. Rowling. Backus, Michael; Wan, Natalia; and Nicholson Library Staff, "2016 Harry Potter Club READ Poster" (2016). READ Poster Gallery. Image. Submission 153.